Allstar Performance Swedged D.O.M. steel tubes are black anodized. 1" O.D. tubes are .095" thick and have 3/4" thread. UB Machine lightweight, swedged steel tubes are knurled for positive gripping. Black powder coated trailing arms / strut rod tubes are available in a variety of sizes. 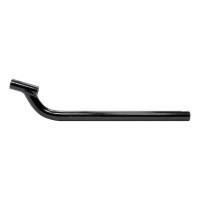 Allstar Performance 5/8 Bent Tie Rod Tube - 12-1/2"
Allstar Performance 5/8 Bent Tie Rod Tube - 13-1/2"
Allstar Performance 5/8 Bent Tie Rod Tube - 14-1/2"
Allstar Performance 5/8 Bent Tie Rod Tube - 15-1/2"
Allstar Performance 5/8 Bent Tie Rod Tube - 16-1/2"